HTML5 enables developers to do a lot these days. In this post, we'll see just how powerful it can be when combined with the ASP.NET Core Razor Pages framework. In one of our projects, we needed to add the possibility to add signatures to PDF documents. A technician fills out a checklist online and a responsible person and the technician need to sign the checklist afterward. The signatures then get embedded into a generated PDF document together with the results of the checklist. 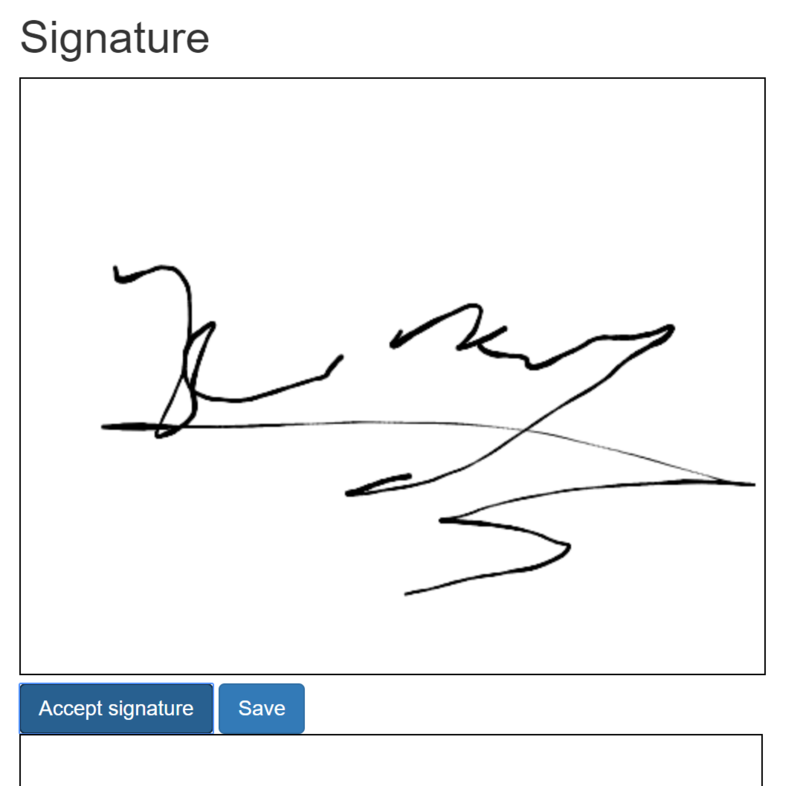 The signatures must be created on a web UI, running on an iPad Pro. It was pretty clear that we needed to use the HTML5 canvas element and to capture the pointer movements. Fortunately, we stumbled upon a pretty cool library on GitHub, created by Szymon Nowak from Poland. It is the super awesome Signature Pad written in TypeScript and available as an NPM and Yarn package. It is also possible to use a CDN to use the Signature Pad. Using Signature Pad is really easy and works well without any configuration. Let me show you in a quick way how it works. The form posts the content to the current URL, which is the same Razor page, but a different HTTP method handler. We will have a look later on. The canvas is the most important thing. This is the area where the signature gets drawn. I added a border to make the pad boundaries visible on the screen. I add a button to accept the signature. This means we lock the canvas and write the image data to the input field added as the last element. I also added a second button to submit the form. The image is just to validate the signature and is not really needed, but I was curious about how it looks in an image tag. This is not the nicest HTML code but works for a quick test. As you can see, creating the Signature Pad is simply done by creating a new instance of SignaturePad and passing the canvas as an argument. After clicking the accept button, I start working with the pad. The function toDataURL() generates an image data URL that can be directly used as an image source like I do in the next line. After that, I store the result as a value in the input field to send it to the server. In production, this should be a hidden field. At the end, I switch the Signature Pad off to lock the canvas and the user cannot manipulate the signature anymore. So after the comma, the image is a base 64 encoded string. The data before the comma describes the image type and the encoding. I now send the complete data URL to the server and we need to decode the string. On the page model, we need to create a new method, OnPost(), to handle the HTTP POST method. Inside we first check whether the bound property has a value or not. Then we split the string with a comma and convert the base 64 string to a byte array. With this byte array, we can do whatever we need to do. In the current project, I store the image directly in the PDF and in this demo I just store the data in an image on the hard drive. As mentioned, this is just a quick demo with some ugly code. But the rough idea could be used to make it better in Angular or React. To learn more about Signature Pad visit the repository.